The Green Party stood candidates in fifty-four of the fifty-eight East of England constituencies, and they lost their deposit in forty-three of them. They only attracted above a tenth of the vote in one constituency, which must be a disappointment for them. My opponent in Southend West attracted 4.7%, and in Rochford and Southend East they just about saved their deposit with 5.0% of the popular vote. All round Essex was not fertile territory (Colchester saw their best vote share with 5.1%) although I doubt this will put them off. Whilst this is the most candidates they have put up, they have been a presence since 2001. So far their impact has been as a spoiler, by and large. In many wards it was the Liberal Democrats who spared them from last place. This was not true in Leigh, although it is true that the Green vote appears to have been drawn largely from disaffected Lib Dem supporters – and enough Lib Dem switchers delivered the surprise of a Tory victory in Leigh. I have already written about the Milton result. This ward gave the Greens their highest finishing position, although quite some distance from success. The number that surprised me was the Westborough vote share. Whilst I have no wish to be rude, the Westborough Green candidate did not have a good hustings and gave every impression of being unprepared for a councillor role. Perhaps that is what attracted the one in nine Westborough voters who chose Green – they wanted a candidate unencumbered by ideas of what he actually wanted to do if elected. You would expect a large Green presence next year, as Southend-on-Sea, electing by thirds, has another round of local elections. Whether the borough-wide 7% attained this year can be reached or bettered we shall see. There will be no TV leaders debates to boost the Green profile, but then again the absence of a General Election should allow smaller parties in lower turnouts to prosper. Are the Green Party cloning their candidates nowadays? Identikit personal statements – as much nonsense as the rest of their leaflets. Sarah Yapp is the Green Party candidate for Rayleigh and Wickford. You can imagine my alarm, especially as I had heard nothing about this. 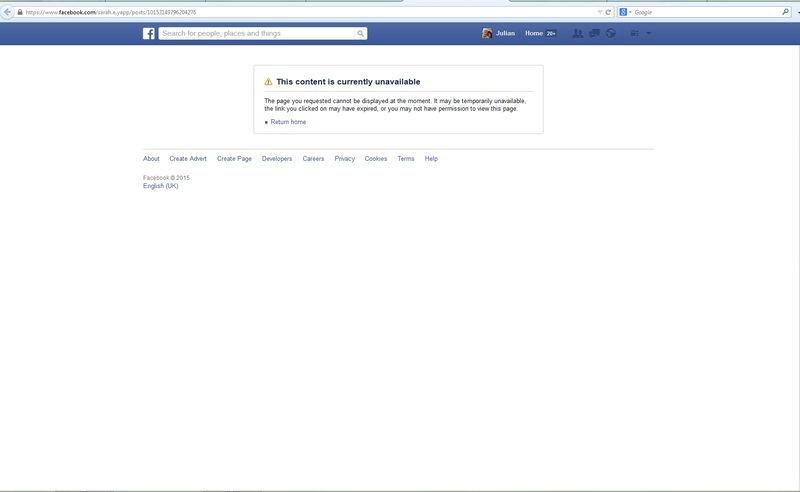 So I decided to check out the link, only discover that the Facebook entry it directed me to had been deleted. Could it be that Ms Yapp had written something rather silly, and upon realising her error had deleted the Facebook entry? If you are going to tidy up you ought to remember your Twitter feed too. Still, I doubt it was a scaremongering entry, or something written without foundation in fact. Whatever it was I am never going to find out. 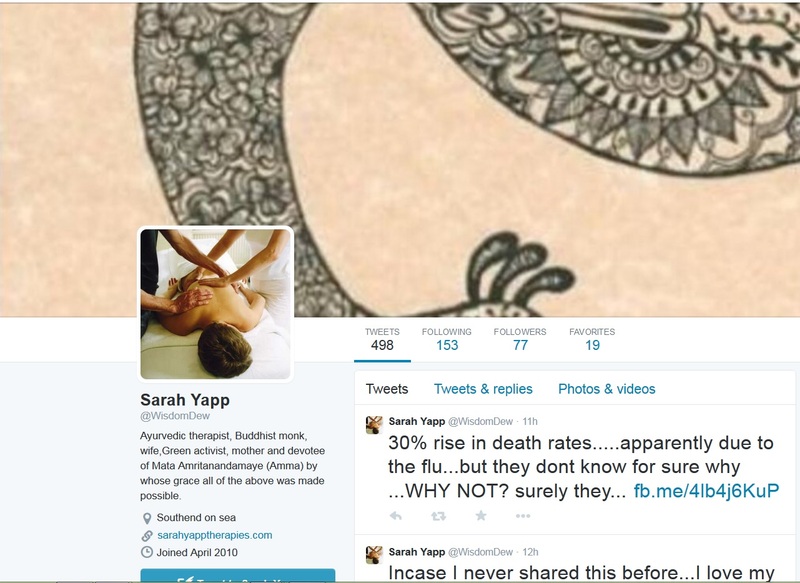 Purely out of curiosity I decided to see what her website (sarahyapptherapies.com) was all about. Unfortunately this was another duff link – Firefox can’t find the server at http://www.sarahyapptherapies.com. Curiously, a 30% rise in yap gives us ‘Yapp’. 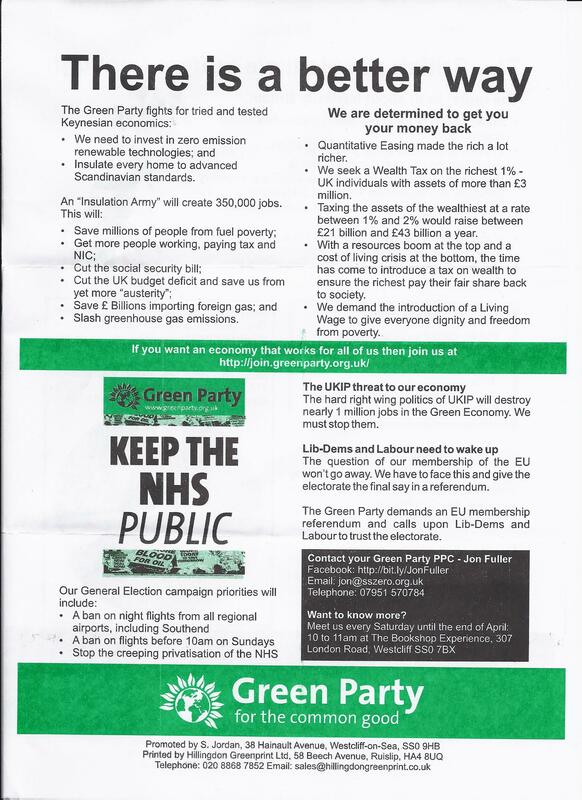 The Green Party have been leafleting, this one has been going through letterboxes in Westborough and Blenheim Park wards recently. This is headed ‘there is a better way’ – true, but the Green way (if Brighton is anything to go by) is not it. There is much in Green Party policy that I can applaud, but there are some issues that I stand some distance from them. We have to protect the environment, for instance, but this does not have to come without economic growth and improving prosperity. I am not keen on the idea of a referendum on the UK’s membership of the EU. Whilst the EU is in need of reform, exit would make us less safe and poorer. Whilst a redistributive element to taxation policy is something most socialists would advocate, I am not sure about a wealth tax. If this a tax on assets such as money held in banks then this can quite easily be avoided. If voters want many of these policies though, they would be better to vote for a party that can actually implement them. A vote for a Green candidate often allows the reverse of what is intended; in Kursaal ward last year, for example, Green votes allowed a UKIP councillor to sneak in, past the Labour candidate. For a fairer and more equal society, and one that looks after the environment, vote Labour. A Green vote will only make it easier for the Conservatives or UKIP to get elected. 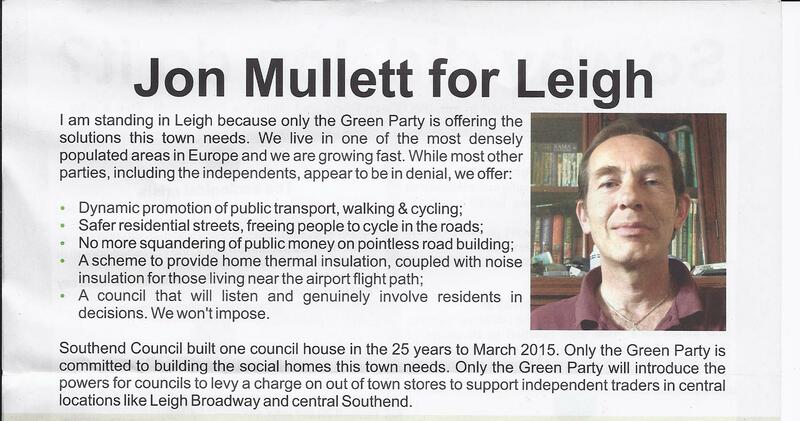 Jon Fuller is the Green Party candidate for Southend West. 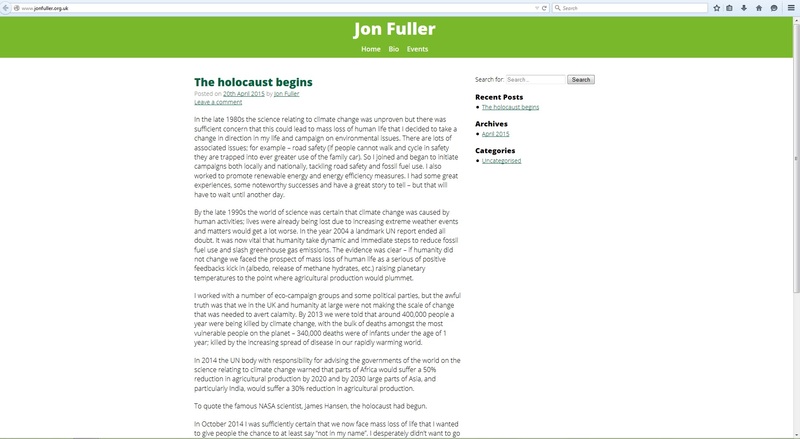 Until recently he had two Facebook accounts; one as himself, and another as Jon Fullergreenparty. He also liked to add comments to his fellow Green Party Parliamentary Candidate’s posts (Simon Cross); these comments have also seemed to disappear. For those who did not have the opportunity to enjoy Mr Fuller’s prose, I reproduce extracts below. By 2010 the most extraordinary thing had happened – Labour had drifted so far away from its roots that it sat on the centre-right of British politics, with the Lib-Dems positioned as the party of the centre-left. 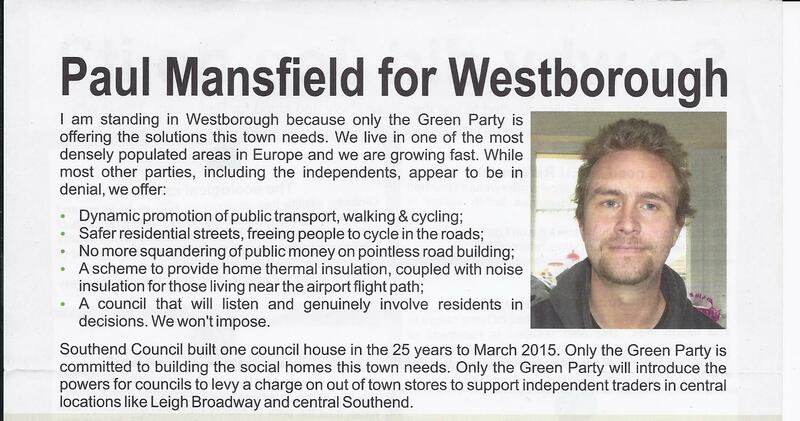 So, here in Southend West, with our first past the post system, it made sense for people like me to vote Lib-Dem. Plus, in Peter Welch (who stood in 2010), we were offered an eco-aware candidate who understood that Southend was the wrong place to build a busy regional airport. But, in 2015, the landscape will be very different – Labour has selected Julian Ware-Lane, Peter cannot stand this time and the Lib-Dem vote is likely to collapse. The electorate has one important function to perform beyond the obvious role of casting a vote on the ballot paper – we have to punish a political party if it promises one thing and delivers another. That is what the Lib-Dems have done – they positioned themselves as the main left of centre party but delivered a hard right agenda. The age of austerity brought a vicious assault upon the living standards of the great mass of us, but the super-rich became a lot richer. We expect that of the Conservatives, not of progressive politicians. So it is entirely understandable that the Lib-Dems will lose millions of votes in 2015. I am now so disillusioned with the Labour Party that it would have been difficult for me to ‘pinch my nose’ and vote for the party in 2015, but the selection of Julian Ware-Lane makes that choice impossible. For me Julian represents everything that is wrong in the Labour Party. I could never vote for him. 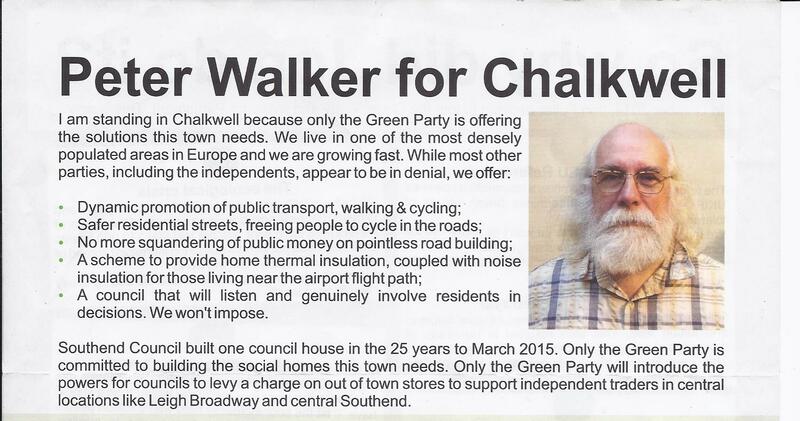 Not only does he support the climate busting expansion of Southend Airport but he has campaigned against speed bumps in our incredibly densely populated town – where children are particularly vulnerable. The patch closest to his home (and mine), that apparently causes him so much consternation, is the set of bumps outside the three high schools and close to Our Lady of Lourdes and Darlinghurst primary schools. I have lived in this constituency for nearly 40 years and spent over 25 years of that time campaigning on road safety. Many people will have seen reports on the campaigns I have organised in the local press, heard me on radio or seen me on TV. In the 1990s, when the UK killed more child pedestrians on our roads than any other EU nation, I campaigned to have speed limits around town reduced and ran a national campaign “Speedlimit” to force politicians to stop killing and maiming so many children. In the mid-90s we made a breakthrough, securing a package of measures that would protect children. Between 1998 and 2007 we saved the lives of 520 children – mostly by installing speed bumps. I am sure everyone will understand why, with that background, I cannot allow the Labour Party to reverse those gains and why I must stand for election in opposition to Julian Ware-Lane. So, let me be clear, I know what the outcome of the election in this constituency will be; but I will not allow the electorate of this town to only be offered different shades of brutality on the ballot paper. I didn’t want my political affiliations to dilute my eco-work but, when Labour chose Julian Ware-Lane as their candidate, I realised I had to act. It is possible that we could have been offered a good Lib-Dem candidate but Peter Welch wasn’t able to stand, and I couldn’t take the chance that someone in the Graham Longley mould would be selected. If I was going to stop Julian, I had to knuckle down & get on with it. It is ghastly. I hate it. But duty calls. David Amess and I went through a bad patch during the 1990s, when the Tories were attacking Labour over its road safety strategy but since then we have worked well together. David attended and spoke at two meetings I organised (the No Estuary Airport Campaign and the Energy Bill Revolution) and when the Southend Airport scheme went ahead, he did at least show respect & sympathy to those who suffered real misery as a result of expansion; something constituents cannot expect from Julian Ware-Lane. Perhaps Labour could apologise for Julian’s crass campaign against speed bumps around the schools and assure the public that the party will ditch any candidate who fails to campaign to protect children from the greatest threat they face? While Labour members and Labour supporters refuse to apologise and make amends, those of us who are driven to protect the vulnerable have an overriding duty to stand up for those who cannot protect themselves. That is why I joined the Green Party and that is why I very reluctantly decided I had to stand against the brutality of the local Labour Party’s policies. Elsewhere in Essex, Simon Cross was chosen as the Green Party’s candidate for Rochford and Southend East and Jon Fuller was selected as the candidate for the neighbouring constituency of Southend West. “I am incredibly privileged to have been asked to stand for the Green Party and will fight a campaign on the issues the other parties are terrified of touching”. I am not sure what issues he thinks I am terrified of touching, and it certainly does not include the question of who removed a large part of Jon Fuller’s presence from Facebook?